Pappu charu is a complete Andhra recipe, a good accompaniment to hot piping rice. I have learned it from my friends. They normally add all other vegetable like carrot, okra, baingan etc., also, but I prefer to add only onion and garlic. We need to make a special powder for this. 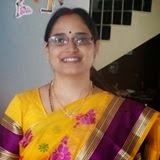 It is called sambar karam. Of course that can used in other curries. Those who taught me use it in other curries also. Soak tamarind in water for half an hour and squeeze juice out of it. Pressure cook toor dal for three whistles and mash it and keep it aside. Heat oil in a pressure cooker, add mustard seeds, cumin seeds, red chilli and curry leaves. Add garlic, fry for a while. Add onions and fry for a while. Once onions turn translucent pour tamarind juice. Add salt and turmeric powder. Pressure cook it for two whistles. Once cooled add saambaar kaaraam and red chilli powder. Allow it to boil, add toor dal. Allow it to rolling boil for two minutes. 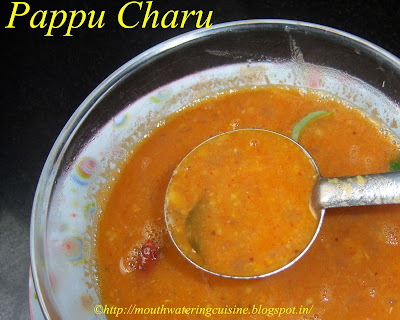 Serve hot spicy pappu charu with hot piping rice.